There is a pervasive misperception in our society that affluent people do not have problems, and smart people do not make mistakes. In fact, many of you have become disillusioned with the false belief that if you were on the “right path” to being successful, nothing bad will ever happen to you, and you won’t experience difficulties, or have sorrow in your life. The reality is, many of the people that you perceive as being successful and happy have overcome anguish, poverty, and personal tragedies to arrive at the point where they are in their life. A good friend of mine once told me, “You see the brightest stars when the sky is the darkest.” Using that metaphor as a correlation, sometimes you need impediments and complications to bring out the best in you. There will undoubtedly be instances in your life when you are in dire straits, or have a feeling of deep distress caused by a loss, disappointment, or other misfortune. Accordingly, the most predominant characteristics necessary to achieve sustainable contentment are to be relentless in all of your pursuits, and learn from your shortcomings, as well as your triumphs. I would even go so far as to say you should endeavor to learn more from your so-called losses, than you do from your inconsequential wins. Believe it or not I have made a multitude of blunders in my life, and faced arduous situations. Nonetheless, through all of my trials and tribulations I learned that you have to let the strenuous times refine you, not define you. What you perceive as a setback is often an opportunity for monumental, far-reaching, impactful, knowledge to manifest itself in your life. The reality is, sometimes you have to relinquish what you think you want, so you can obtain what you actually need, and rightfully deserve. “Sometimes You Have To Lose To Win” acknowledges the premise that everything happens for a reason, and you would not be the person you are today if you had not encountered the onerous events in your past. Hence, to live your dreams, and fulfill your destiny, you cannot exert your past, or current disappointments, as justification for why you cannot do better, and be better. Alternatively, acknowledge the bygone exasperating situations that occurred and view every event that seeks to obstruct, or hinder, your progression as a learning experience that is preparing you for an exalted future. Be encouraged, have faith, and trust that if you put forth the appropriate effort, and maintain the prerequisite attitude and perspective, immense accomplishments are forthcoming, and something phenomenal is going to manifest itself in your life. 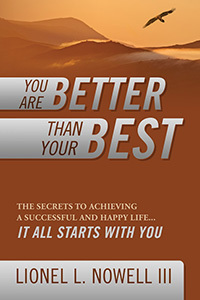 I am excited about what the future holds for you, and believe that if you are truly committed to being better than your best, and are not willing to accept less than you deserve, there is sagacity and knowledge dispersed throughout this book that will amplify your life spiritually, intellectually, and emotionally. 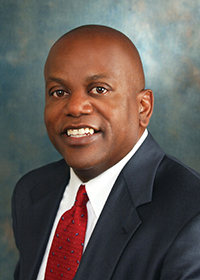 Lionel L. Nowell III is a member of the board of directors of American Electric Power, Bank of America Corporation, and Reynolds American, Inc. Lionel is also author of the self-help book entitled You Are Better Than Your Best. Over the past thirty years Lionel has worked in senior leadership positions with PepsiCo, as well as several other fortune 500 companies. 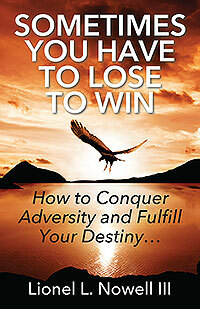 Sometimes You Have To Lose To Win is a logical, concise, yet insightful book that is saturated with the wisdom Lionel acquired as he traveled the path to his personal success. This book is truly a must-read and it will challenge and motivate you to accomplish more, and achieve greater success, in every aspect of your life. Lionel and his wife, Denise, have four grown children and make their home in Collier County, Florida.